As a Florida resident, you probably know how disruptive hurricanes can be to your daily life. If you have a backup generator, you count on this appliance to keep the power on in your home. However, if you haven’t thought about your generator since the last storm, or if the appliance didn’t function properly when you needed it, it could be time for a generator repair. The certified, licensed, and trained technicians at Reliable Power Systems are experts at providing backup generator repair. We service all major makes and models with industry experience dating back to 2002. Looking for generator repair services near me? If you’re located in Palm Beach, Broward, Miami-Dade, or Martin County, Reliable Power Systems is here for you! Contact us today to schedule emergency generator repair. How Can I Tell If My Generator Needs a Repair? To avoid being left in the dark when you need your generator the most, plan to schedule generator maintenance every six months. These preventative visits catch small issues before they grow into major problems. They also keep future generator repair costs down. We are also able to service and repair systems even if they were not installed by us originally. Low coolant levels: A coolant leak can quickly drain levels to zero. If your generator has a sensor, you’ll learn of low coolant levels in plenty of time to have the lines repaired and refilled. Faulty wiring: Corroded or frayed wires may stop a generator from working properly. For your safety, leave all electrical work to a licensed generator repair specialist. Blocked fuel lines: Running out of fuel doesn’t just cause a generator to shut down. If the line remains empty, it could develop a blockage or experience other wear and tear. A repair is needed to restore the generator’s functionality. Malfunctioning fuel gauges: This problem may not directly impact performance, but because it prevents you from knowing when the fuel is low, you may run out of propane without even knowing it. A repair prevents unpleasant surprises in the future. Faulty circuit breaker: If the circuit breaker trips frequently, the generator will not run consistently. You may need an electrician to replace the breaker to ensure continued performance. Old age: Modern generators last for years, but if yours is over a decade old, a breakdown may signal the need for a new emergency power installation. Why Choose Reliable Power Systems for Generator Repair? If you’re looking for quick, thorough emergency generator repair, Reliable Power Systems offers everything you need. We keep a watchful eye out for small, hard-to-find problems and tackle the underlying issue to ensure you won’t encounter any more generator problems any time soon. We’ll also make sure your generator is operating efficiently and safely so you can count on having backup power without putting your family’s health at risk. We have provided reliable generator services to residents of Palm Beach, Broward, Miami-Dade, and Martin counties since 2002. Our technicians are fully licensed, trained, and certified. We are A+ rated with the BBB and A rated on Angie’s List. 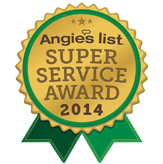 We were the proud recipients of the coveted Angie’s List Super Service Award in 2013. To work with a trustworthy generator repair shop in Southern Florida, please contact Reliable Power Systems today. We serve Palm Beach, Broward, Miami-Dade, and Martin counties.